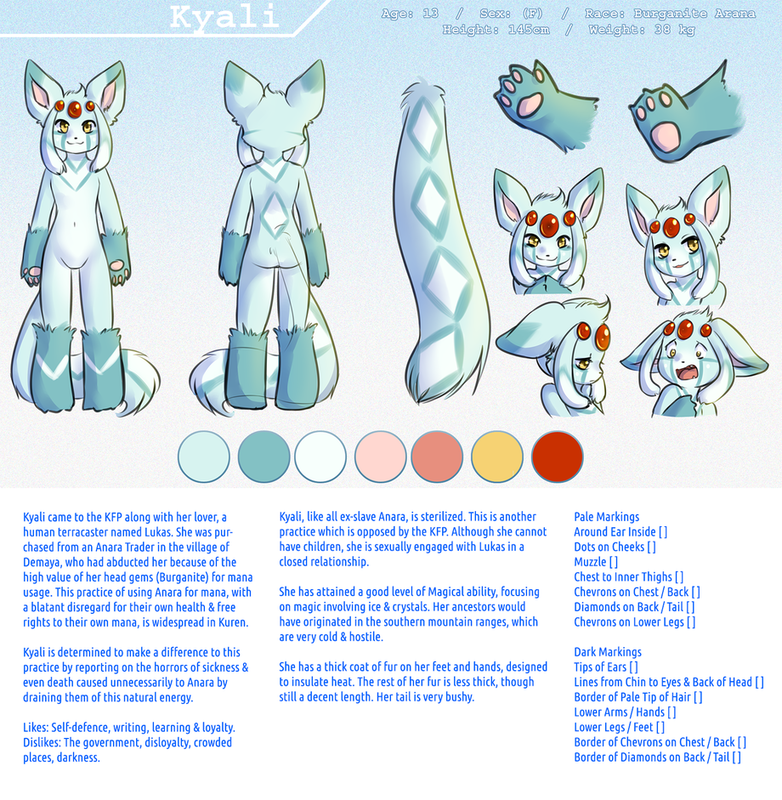 Kyali is a strong-willed girl, captured at an early age by a slave trader and sterilized by law. Strong-willed, intelligent & thoughtful. Kyali doesn't believe that her age and petit stature are any objective to success in her campaign for equal rights. Likes: Self-defence, writing, learning & loyalty. Dislikes: The government, disloyalty, crowded places, darkness. Kyali came to the KFP along with her lover, a human terracaster named Lukas. She was purchased from an Anara Trader in the village of Demaya, who had abducted her because of the high value of her head gems (Burganite) for mana usage. This practice of using Anara for mana, with a blatant disregard for their own health & free rights to their own mana, is widespread in Kuren. She has a thick coat of fur on her feet and hands, designed to insulate heat. The rest of her fur is less thick, though still a decent length. Her tail is very bushy. Various, from peasant dress (her previous dress as a slave) to regal as Lukas' lover. 3 Burganites on her head. Not removeable. leavs her a cookie on this place to.....ruuuuns.